People wait eagerly for the coming of Delhi winter, which comes soon after Diwali. The first nip in the air is welcomed by wearing the first winter clothes and dark make ups. One thing that women like about Delhi winter is that the make up stays longer, they don’t sweat and they can wear dark colourful clothes. 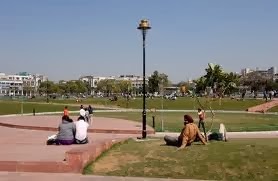 In the parks there are fewer walkers in the morning, during Delhi winter, as the day breaks late and so people walk in the evenings or late in the morning. By 11:00 AM there will be enough sunlight, so the elderly and housewives gather in the parks to bask in the sunlight. Basking in the sunlight during Delhi winter is as delightful as having a cup of coffee during coffee breaks. The women in the park do a lot of small talk while cutting vegetables or knitting woolen clothes. During Delhi winter, in the evenings, all the foods stalls are crowded by people enjoying a hot snack in the winter chill. The chinese food stall has the largest soup sales during this season. People also like to have a lot of meat in this season. Usually people in Delhi have a predominantly vegetarian diet, they say in winter any food you eat is digested fast so fatty food like chicken, meat, butter, and cheese all are used lavishly in diet. People do not like to stay inside during Delhi winter, there are sometimes 20000 marriage on a single day during Delhi winter. Passing by the marriage celebration in open tents, you can see beautiful women in traditional wears, and hardly any winter clothes. Curiously women say they do not fall ill in the winter chills. Grandmothers wears only a thin cardigan during the thick of Delhi winter. They say Delhi winter is not strong. The diet of the natives of north India, makes them resistant to the harsh Delhi winter. Having a lot of green in the diet helps you gain resistance from the winter diseases. The weekly market held by the road side, in Delhi winter, looks much prettier than the fruit and vegetable section of a hyper market. There are a variety of vegetables which is garden fresh, because of the cold weather. The fenugreek leaves, spinach, mustard leaf, mint leaf and a variety of other local leaves make the vegetable stalls looks greener and prettier. “Batua”, a common herb found in parks, is a very good winter protector which can be had with salads or other vegetable dishes. Delhi winter is a partying time and not a a lazy man’s favourite climate. Winter is usually associated with death and darkness, there is a phrase in english ‘during the winter’s of life’. The activities connected with Delhi winter are of enjoyment like basking in the sun, having lot of food, marriage celebrations and so on. Life never stops in Delhi winter, the daily businesses run as usual in freezing winter or scorching summers.